Gone Missing was researched and created by The Civilians, an investigative theater company based out of New York City, who derive their original works from real interviews with people beyond the theater. 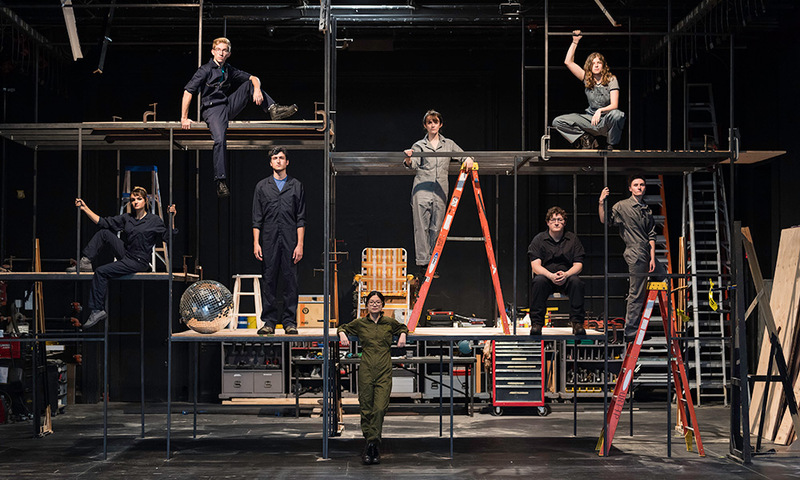 The piece was written and directed by Obie award-winning writer Steve Cosson and features the music and lyrics of the prolific composer Michael Friedman. Coincidentally, a two-night revival of the show in New York City this summer was directed by Ken Rus Schmoll, who directed a production of Octavia at Todd Theater in 2017, and was dedicated to Friedman, who died a year ago from AIDS-related complications. The student cast includes Rick Carl ’19, Ewan Shannon ’20, Famy Xia ’20, Olivia Banc ’21, Rosie Flanagan ’19, Shawn Cummings ’21, Madeleine Fordham ’21, and Adrian Go ’19. Reagan Casteel ‘20E, who is studying composition and music education at Eastman, is musical director. Tilly Grimes, an award-winning costume designer, who has worked on several productions at Todd Theater, is costume designer. Thomas Dunn, the recipient of the 2009 Kevin Kline Award for Outstanding Lighting Design, is lighting designer; and Obadiah Eaves, who has worked on and off-Broadway, and whose commercial jingles and scores have aired on Nickelodeon, the History Channel, and A&E, is sound designer. “Being in this production has taught me how to develop a character, “says Adrian Go ’19. Go, who plays several characters in this production, is a brain and cognitive sciences major and music minor. “The experience of loss is something that everyone can relate to. The audience will hopefully walk away feeling that they are part of a larger community, having related to some, if not all of the characters presented on the stage,” says Go. The production runs Thursday through Saturday (October 4-6) and Wednesday through Saturday (October 10-13) starting at 8 p.m. There are two matinee performances: Saturday, October 6, and Sunday, October 7, at 2 p.m. All performances take place in Todd Theater on the University of Rochester’s River Campus. Tickets are $8 for University of Rochester students, $12 for alumni, faculty, staff, and for seniors (65+), and $15 for the general public. Tickets may be purchased online at http://www.sas.rochester.edu/theatre/ or by calling the box office at (585) 275-4088. Tickets may also be purchased up to an hour before each performance at the box office.